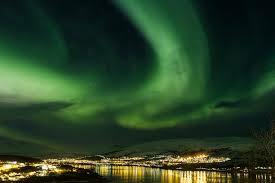 Well isn’t Tromso in Norway a delightful little surprise!! * I wanted to catch a slow boat north to see the awesome coastline of the Vikings. * I needed to visit a place so contrasting to where I have lived my entire life and know that others live quite happily never seeing 40C on a temperature gauge. * I wanted to know what it’s like to stand amidst the giant, healthy, blonde skiers who win at the Winter Olympics.. just like Aussies used to do at the Summer ones! However, mostly, I just wanted to see the Northern Lights and Tromso is our starting point to see them… but before we board our slow boat tomorrow, I thought we should explore and find out more about this buzzing little metropolis. * It’s a lovely, modern little city with about 72000 friendly people living here. This friendliness was proven today by the quietly spoken, local peacemaker who courageously interrupted our argument at the bus stop to offer the correct directions. * It’s the ‘Ar ctic Gate’, frequented by heroes like Amundsen and just over 2000 kms from the North Pole… that’s Sydney to Townsville or Adelaide to Brissie and quite a doable road trip with good music, good company and a good red! * It has the world’s most northerly university, beer brewery and cathedral and to day we visited two of those on the number 34 and 24 bus. 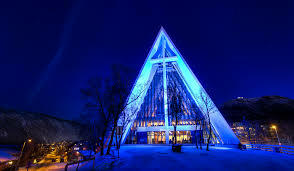 * It’s ‘Arctic Cathedral’ is the most famous landmark in town and is a masterpiece in the shape of an iceberg. It is often referred to as the ‘opera house of Norway’ comparing it to the Sydney Opera House… I’m now feeling very ‘at home’. looks amazing!!! may a diversion from the Mediterranean for me? I am so excited for your Camino journey and we’ll enjoy something warmer by the time Rob and I have finished chasing the lights here in Norway! Lyn Cook is our ‘go to’ travel guide on all thing Scandi… we should all do lunch!